Coverage: one 12.5 pound container casts a block 12" x 12" x 1.25"
If you're looking for a fireplace cement with a little bit more flexibility, try Rutland's Castable Refractory Cement (perfect for fireplaces). 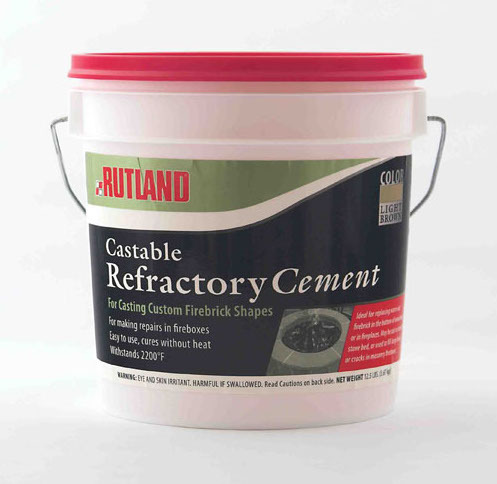 Refractory cement is a versatile compound that can be cast into custom shapes, making it ideal for replacing firebrick, filling large, irregular holes in masonry fireboxes, and casting solid stove beds. You can even use it to repair outdoor fire pits. And, because this castable refractory cement usually dries in about twenty-four hours and cures without heat, using it couldn't be easier. Please Note: This cement contains Portland Cement. It should not be used without safety goggles, rubber gloves, and a NIOSH-approved dust respirator. Is this product a premixed cement or is a dry cement that need to be mixed? This is a dry cement that will need to be mixed. How does the 25 pound tub have the same amount of coverage as the 12.5 pound tub (Coverage: one 12.5 pound container casts a block 12" x 12" x 1.25)? The 25 pound tub will offer 2 square feet of coverage when applied at 1 1/4 inch of thickness. How many square feet would I get per tub? This 25 pound tub will offer 2 square feet of coverage when applied at 1 1/4 inch of thickness. It is not recommended to spread the product any thinner than 3/4 of an inch. Can this product be successfully applied at low temperatures (specifically, at temperatures in the 15-30 degree Fahrenheit range)? Per the manufacturer, an application temperature down to 0 is acceptable for this product. This is a chemical reaction aided product and mixture of water to the dry cement mix creates a small amount of heat, aiding the cure and preventing the product from curing improperly in cold temperatures. Up to how many degrees can this withstand? This castable cement is appropriate for applications with temperatures as high as 2,200�. Is this a liquid or a powder to which you add water? This is indeed a dry mix material that must have water added prior to application. The manufacturer recommends 1 quart of water per 12 1/2 pounds of material. I needed a refractory mortar for outside use and this was recommended and will presumably do the job. It was, however, very difficult to use, even with the very detailed instructions. It sets up so quickly that there is no moving the firebricks. Set one in place and it stays there. ProsFor an outdoor fireplace it is important to have a refractory mortar that can hold up to rain and snow. Instructions are very good. ConsA little difficult to mix and very difficult to use. The bricks will not slide for adjustment once put in place-it sets very, very quickly. I have an old large fireplace that uses large firebrick. Well after so many years, some of it broke. I needed a solution to cast my own bricks. Enter Rutland. Got it home, added the water, mixed in it's own bucket and pour into mold. Set up in a few hrs. Hard and ready to use in 24. Didn't have to heat treat it. Just had to bring up the heat in the fireplace gradually. We have been up and running the fireplace for 3 months now, everything is great. So happy we chose this castable cement.